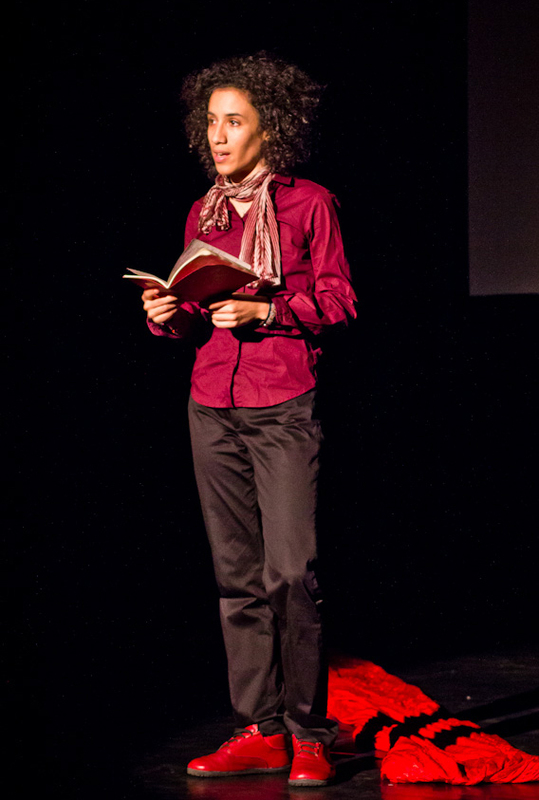 Layla Zami is an innovative academic and artist working with words, music, performance, and video. Born in Paris, France in 1985, Layla gains inspiration from a rich Jewish-Russian-German and Afro-Caribbean-Indian heritage. Based in Brooklyn, NY, she is a new Visiting Scholar in the Department of Humanities and Media Studies at Pratt Institute, where she is involved in research, teaching and student advising in the Performance and Performance Studies Graduate Program. Her transdisciplinary approach to research and teaching orbits around matters of dance/ performance / corporeality; cultural memory / trauma; gender / sexuality; diaspora / race / migration; and space-time. Layla earned a Ph.D. from the Center for Transdisciplinary Gender Studies at Humboldt-University, Berlin (2017). Her dissertation explores the role of dancing bodies in the transnational production and transmission of cultural memory. She was a Visiting Research Scholar at Columbia University, Institute for Research on Women, Gender and Sexuality (2015-2016), and at the University of California San Diego, Department of Theatre & Dance (2015). She also spent a year as an exchange student at the University of Cape Town (Center for African Studies), and holds a bilingual M.A. from the Sciences Po Paris School of International Affairs. A Founding Member of the Dance/NYC Symposium Programming Committee Layla also serves on the Dance/NYC Task Force working in cooperation with the NYC Mayor's Office to advise and assist on their Immigrant Artists Research Initiative. She also serves as an Assistant Producer and Board Member at the International Human Rights Art Festival (IHRAF). Other professional experiences include research and event management in the science and technology branch, for Fraunhofer-Gesellschaft and FIMOR North America, as well as in the non-profit sphere, for instance at the AfricAvenir International Headquarters in Douala, Cameroon; and at the UNESCO Headquarters in Paris. Layla Zami also worked at the French Parliament as a close collaborator to Christiane Taubira, former Head of the French Department of Justice, who passed important laws in the fields of racial and gender equity. Honors and awards include a Doctoral Fellowship (2013-2016) from the Jewish Talents Program administered by the Foundation Ernst-Ludwig-Ehrlich-Studienwerk and the German Federal Department of Education (ELES/BMBF Begabtenförderung), and a Graduate Award from the Modern Language Association (MLA). Her academic and artistic projects have been funded by Humboldt-University, Technical University, Bielefeld University, Mainz University; and by foundations such as Rosa-Luxemburg-Stiftung, Gerda-Weiler-Feminist Foundation, Fondation pour la Mémoire de la Shoah (FMS Paris), Amadeu-Antonio-Stiftung. Layla is also an awardee of the French Ministry of Youth, Bourse Envie d'Agir; Zurückgeben, Foundation for Jewish Women in Arts & Sciences, and DOSHIMA Jakarta where she received the European Documentary International Award of Recognition for Dancing Through Gardens. As a teacher, Layla Zami was honored with the 2017 First Prize in the Teaching Award from Humboldt-University, Faculty of Humanities, Social and Cultural Sciences (Fakultätspreis für gute Lehre). The class of her own design "Performing Memory: race, gender and diaspora in cultural discourses and practices", ranked Best Humanities Seminar across Germany in 2016. Recently, Layla gave talks, presentations, and lectures-performances at institutions such as Rutgers University Philadelphia; Goldsmith University London; Humboldt-University Berlin; The Center for the Humanities at the City University of New York; Bielefeld University; Europa-University Viadrina, Mainz University; Cité Internationale Universitaire – Maison-Heinrich-Heine Paris; Yeditepe University Istanbul; Literaturfestival Potsdam. Her academic and creative writing in German, English and French was published by UNESCO; w_orten&meer, transcript; Orlanda Frauenverlag; AfricAvenir Exchange&Dialogue, as well as in juried journals, newspapers and magazines. As an interdisciplinary performer, Layla Zami creates and performs music (saxophone, kalimba, chalumeau, loops), poetry and physical theater in collaboration with the dance company Oxana Chi & Ensemble Xinren. In Germany, she performed at Werkstatt der Kulturen Theater, Hebbel am Ufer Theater (HAU), Homestory Deutschland Hamburg, Poetry Meets Soul Prachtwerk Berlin, Galerie Gondwana, Societätstheater Dresden, Technische Universität Berlin (Technical University) among others. Tour history in North America includes Abrons Arts Center, Dixon Place, Bronx Academy of Arts and Dance, CUNY BMCC, Rutgers University, Triskelion Arts, University of Toronto (Robert Gill Theatre). Oxana Chi and Layla Zami also performed at festivals, conferences and events in Indonesia; France; Taiwan; India; Martinique. As an artist, Layla completed professional development programs in performing arts with the New York Foundation for the Arts (NYFA), Oxana Chi Company, and Conservatoire du Mans. She held residencies at the Jamaica Center for Arts and Learning in Queens, NYC and at the Maison Rouge/Maison des Arts in Martinique. She also enjoyed training with very talented performing artists such as Oxana Chi, Suheer Saleh, Pat Hall, Bilonda Bukasa, Xiao Lin, Mestre Grande da Bahia, Fuasi Abdul-Khaliq and Parageet. As a co-founder, with Oxana Chi, of li:chi – transcultural network for art & political education, Layla curates and organizes transdisciplinary events, conferences and festivals. She initiated and co-chaired the International Symposium-Festival Moving Memory held at Berlin Technical University October 20th-22nd, 2016 in cooperation with the AlleFrauen* Referat and the Berlin Future Program Berlin 2050 (Stadt der Zukunft). Based on this success, she curated the Moving Archives event at the CUNY Graduate Center in collaboration with the Center for the Humanities in 2018.